LG products are known for their elegant aesthetics, and the 27UD68 is no different. With each release of new graphics cards, we are finding out that 4K PC gaming is becoming the standard norm instead of the exception. Who knows where the future is, but we think that investing in a 4K display now is a good idea. In this review, we want to introduce you LG 27UD68 4K Ultra HD monitor with an IPS panel and FreeSync support. 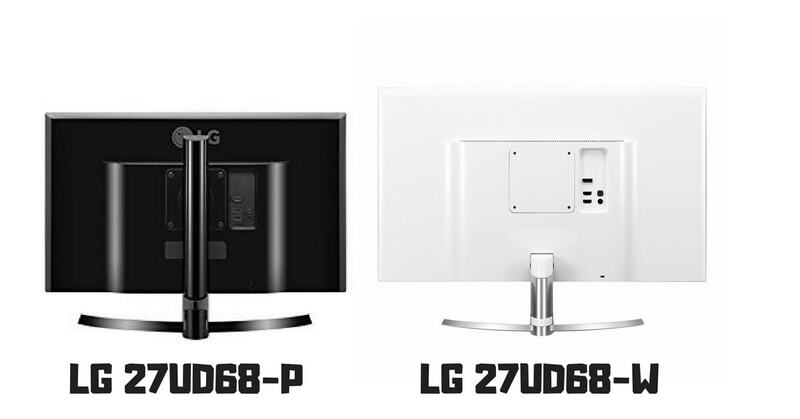 To make it clear, LG has released the 27UD68 monitor under two different SKU numbers – 27UD68-W and 27UD68-P. 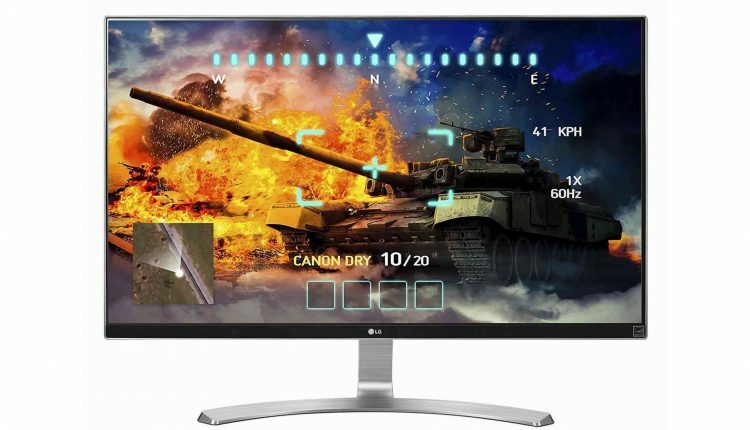 Both are LG´s top 4K monitors and are fantastic for gamers and graphic designers alike. In fact, they are almost identical in every way, but there are a few factors that should help you decide which one is best for you. Where is the difference? P model has a black back panel, W model has a white back panel. 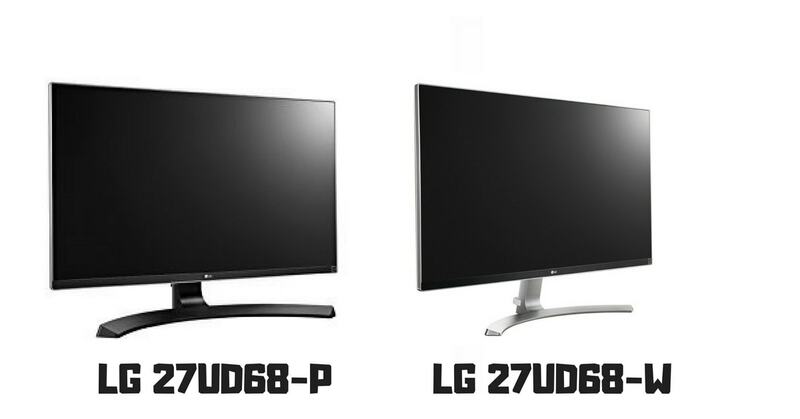 Also, the LG 27UD68-P has 1 display port, and 2 HDMI, whereas the LG 27UD68-W has 1 display port, 1 HDMI, and 1 VGA. And the fun part! Sometimes the price difference between these two models is up to $100 USD. LG products are known for their elegant aesthetics, and the 27UD68 is no different. The 27-inch UHD panel is enclosed in a bezel-free black cabinet with black trim. This creates an impression of more space than the 27 inches of the display. Overall, the smooth curve of the base provides stability, assuring dependable performance with a touch of elegance. The LG 27UD68 27″ monitor features Ultra HD resolution (3840 x 2160) producing high-quality images with improved details and creates great visual enjoyment. The clarity and details will amaze you, even if you look from a close distance. With over 99% coverage of the sRGB spectrum, this 4K monitors looks like an ideal solution for graphic designers, photographers or anyone looking for accurate colors. Colors are excellent and highly realistic right out of the box, and because 27UD68 comes with IPS panel, it offers excellent wide viewing angles while keeping both contrast and color high. What´s more, with 8.3 million pixels on the screen, the Ultra HD is four times sharper and better than a standard HD monitor. Are you the proud owner of AMD graphics card? If your answer is yes, then you will definitely take the full advantages of this monitor. Just by connecting it with your graphics card thought the DisplayPort, you will enable the FreeSync feature which synchronizes the refresh rates of the GPU with the monitor. The FreeSync eliminates screen tearing and stuttering and offers gamers fluid movement through hi-res, fast-paced games. 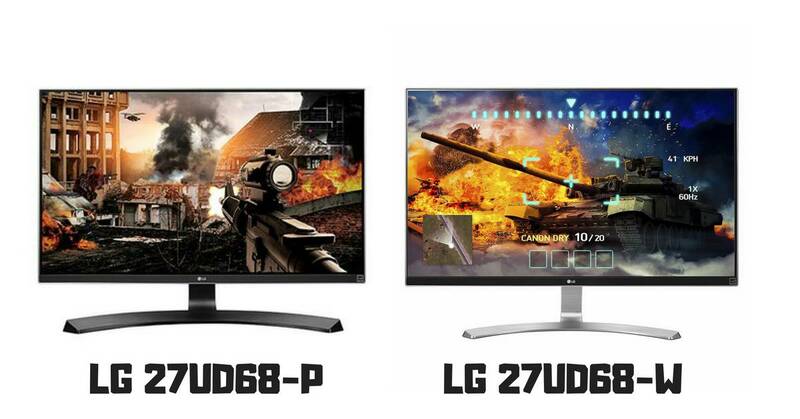 To be honest, both these LG´s models (27UD68-W and 27UD68-P), are not designed for professional gamers. Yes, you have awesome colors and fantastic details, but the response time of 5ms is not ideal for competitive gaming. You should know that both models are equipped with IPS panel, which on one side provides the user with amazing visual performance, but on the other side is not fast as TN panels with their response time of 1ms. If the response time is not an issue for you then you should know that LG 27UD68 has many interesting add-ons which are helping to achieve the fantastic visual quality. Another useful feature which will improve your work efficiency is Split screen 2.0. Both monitors LG 27UD68-W and LG 27UD68-P are huge displays… perfect for multitasking. You can resize and display multiple windows at once, with 14 options including four different picture-in-picture (PIP) choices. Third features worth to mention is so-called Game Mode. It offers 3 modes, 2 First-Person-Shooter modes, and an RTS pre-set mode so you can choose the best mode for your games. In addition to this, you are able to quickly optimize the monitor settings to activate Black Stabilizer which helps the player to see superior detail in dark scenes while the Dynamic Action Sync feature assures fluid and smooth gaming action. As we mentioned at the beginning of this review, these two models offer different ports. While the LG 27UD68-P has 1 display port, and 2 HDMI, the LG 27UD68-W is equipped with 1 display port, 1 HDMI, and 1 VGA. For designers, photographers or for casual gamers, both monitors are amazing options. And the price, wow. These monitors deliver excellent color performance, great contrast, great brightness, and smooth gameplay thank the FreeSync technology. Plus the elegant looks is a pleasure for the eyes. But if you are competitive gamers who need a monitor with fast response time, look further. The IPS panel offers only 5ms, while much cheaper devices with TN panel have a response time of 1ms. We know, TN panel isn´t ideal for 4K resolutions, but paying $400 for the 4K monitor with IPS or $250 for TN panel is a huge difference. For designers, photographers or for casual gamers, both monitors are amazing options. And the price, wow.